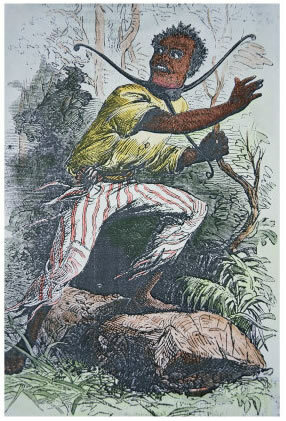 I keep having images of Herman Cain barefoot, covered in sweat and mud, wearing an old patchwork shirt and hand made burlap pants held up by a rope rather than a belt, out of breath and frantically running for his life; to freedom. Menacing sounds of barking dogs in the distance focused on Cain's scent. Not far behind, hot on Cain's trail, are black overseers determined to keep their fellow black slaves in check for their white liberal democrat massas. Cain's crime? He achieved success via traditional routes; education, hard work and character. Cain did not use or need Affirmative Action or lowered standards; a clear violation of the left's law for acceptable minority success. Cain was correct in saying black voters have been brainwashed by the democrats. Black overseers have kept blacks obediently and mindlessly monolithically voting democrat for years despite huge elephants in the black community's living room; over 70% black high school dropout rate, over 70% black out of wedlock births and unprecedented black unemployment under Obama. Obama uses his skin color to insulate himself from criticism as he usurps authority like no other president before him. All opposition to Obama's hostile takeovers is branded racist. Obama preaches his gospel of entitlement; everyone is a victim and everyone is entitled to the fruit of someone else's labor. Again, anyone daring to disagree with Obama's sermons are declared heartless and racist. As president, Herman Cain would be the left's worst nightmare. Cain would be historic, not as the first black president, but as the first black “leader” to occupy the Oval Office. Cain's Justice Department would distribute equal justice to all Americans regardless of skin color; unlike the Obama Justice Department who said they would not press charges against fellow blacks. And for this reason, black overseers and liberal white democrats must capture, hogtie and drag Cain's black “n----- a--” back to the liberal democrat plantation where he belongs. Watching MSNBC white host Lawrence O'Donnell chastising black presidential candidate Herman Cain for not participating in the 1960s civil rights movement infuriated me.